Phew…Here’s a tough cookie! But, oh so worth it! Its Diwali time and what is Diwali without Ladoo! 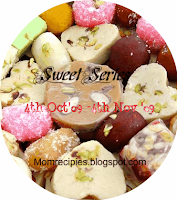 Ladoo was always a favorite at our households! I’ve tried making these once before but could not shape them into ladoos. So, just ate them with a spoon. The same thing almost happened this time too. I made the bhoondi and put it in the sugar syrup and tried to make balls out of it but could not. Then my mother in law came to the rescue. She tried and succeeded and so we had ladoos at out place! Water – 1 cup to mix with besan. On hindsight – add a ½ tsp of baking soda – I missed this but I’m sure it will help to keep the bhoondi’s round. Sieve the besan in a mixing bowl. Add the baking soda if you are using it at this point and sieve together. Whisk the water in the besan and make a dosa like batter without any lumps. In a wide pan, add the sugar and water and bring to a boil to make sugar syrup. You will need to get a one string consistency for the ladoos. This is probably the most critical step as this ensures if you get the ladoo shape or if you will pick up the sweet bhoondi with a spoon! Here are my ladoo gadgets! The bhoondi karandi! I was so excited when I got this at a store in Salem that the store guy thought I was a little crazy! Before you start frying the bhoondis, fry some broken cashewnuts and rasins in a little bit of ghee and set aside. Heat up oil in a wide pan at medium heat. Before starting to make the bhoondis, just test with a couple of drops of the besan batter. If the bhoondis spring up and are nice and round, the batter consistency is perfect. If they make elongated bhoondis, the batter is too thin – add some besan. If they sink to the bottom and clump together, the batter is too thick – add some water. Fry the bhoondis for just about a minute. You don’t want them to crisp up. They should be cooked and yet soft inside. Move the bhoondis straight from the oil to the sugar syrup and mix well. When all the bhoondis are done, add the cashews and raisins to the bhoondis soaking in the sugar syrup. I had some extra syrup. So, I scooped out all the bhoondis into another pan. And here comes the big part! You will now have to make balls out of this. And this has to be done when the whole thing is still hot. I could not do this and my mother in law helped me with this. That’s where experience comes into play I guess! Here are the ladoos done! This one’s for you! 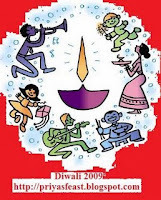 Happy Diwali! Ladoo looks so good. It is really eye candy for me. The pictures all of them are so good. Thank you for taking time to take picture and post them. Excellent job. Keep it up.